I have a large collection of variegated yarns and always struggle to find patterns that won’t be overwhelmed by the yarn. 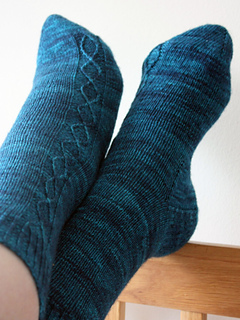 One solution is to knit what is essentially a vanilla sock with a slipped stitch detail, an idea that led me to my Siren song socks. 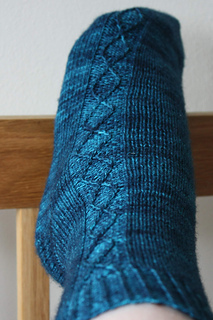 The stitch pattern is used in a single panel along one edge of each foot (the socks are a mirrored pair), and is easily memorised; the socks are named after the Siren, a mythical creature, whose call was said to lure sailors to rocks – the stitch pattern used is one that will have knitters saying ‘just one more round’ as they watch the pattern emerge. 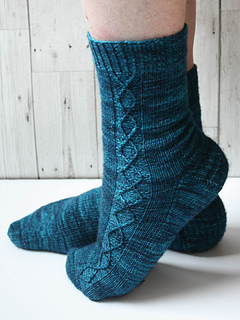 The pattern is knitted from the top-down and is written to be needle-neutral and can be knitted using either the magic-loop technique, short circulars or DPNs, depending on your individual preference. The pattern also features helpful hints for beginners. 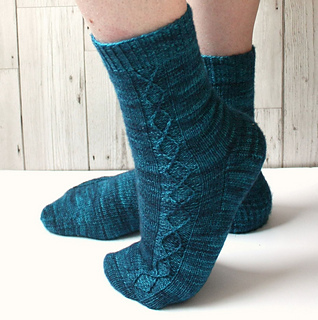 The cabled stitch pattern is given as both a chart and written instructions. Finished sock circumferences, 15 (17.5, 20, 22.5, 25) cm [6 (7, 8, 9, 10) in]; for the best fit, choose a size that is approximately 2.5 cm [1 in] smaller than your foot circumference. 32 sts and 44 rnds = 10 cm [4 in] in stocking stitch worked in the round on 2.5 mm (US 1.5) needle(s) after wet blocking, or size needed to obtain correct tension. Up to 425 m [465 yds] of sock yarn. 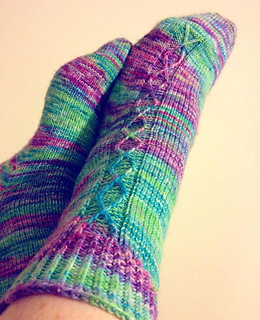 I would recommend using a dedicated sock yarn that is tightly plied wool yarn and has some nylon content for durability. 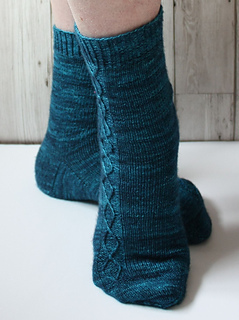 It is possible that if you are knitting for very large feet (or are knitting socks with very long legs) you may require more than 425 m [465 yds] of yarn for a pair of socks. Multi-coloured version: Unbelievawool MCN sock: 80% merino, 10% cashmere, 10% nylon; 400 m [437 yds] per 100 g; colourway Mermaid hair Both pairs of socks are knitted in size M to fit a foot 26.5 cm [10.5 in] in length, with a leg length of 20 cm [8 in].